When I first began researching van camping this past spring, I knew there was going to be one element that would make or break the experience. Could van camping be comfortable? I don’t consider myself overly fussy. After all, I still enjoy tent camping with my husband but now that I’m in my mid-40’s, the days of sleeping on the ground are over. 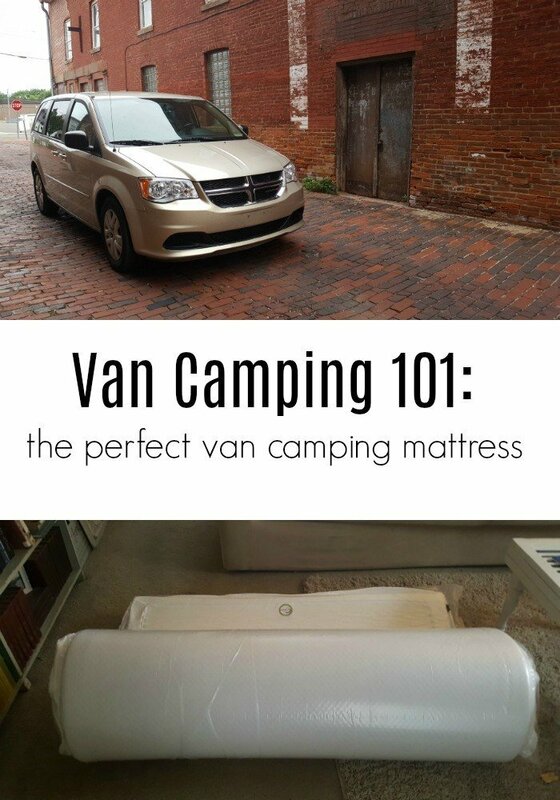 I need a good van camping mattress, an air mattress just isn’t going to cut it anymore. So our first step into creating our part-time Dodge Grand Caravan Camper was to hunt down a van mattress that would make sleeping in a minivan an enjoyable, and dare I say fun, experience? I can’t say that we had a ton of options available to us but one of our concerns was the time it would take to set up camp. We ultimately wanted our minivan camper set up at all times so we could pull over and go to sleep with little to no effort and we wanted to be inconspicuous since we often sleep at rest stops or Walmart parking lots. We didn’t want anyone seeing us setting up our bed or mattress for the van. One, we could skip the mattress and use a mattress pad with a sleeping bag but that didn’t sound appealing to someone who prefers to snuggle with her husband in comfort. Two, we could purchase a foam mattress, like an egg crate foam topper, something like this that folds, or another foam mattress for our van but that wasn’t really what I had in mind either. Three, we could buy an air mattress for a Dodge Caravan or similar vehicle. This was the one we considered the most other than our final selection. and are less expensive than a traditional mattress. But the question is, are air mattresses comfortable? That answer is debatable and a matter of personal preference. In my experience camping, air mattresses have been okay but I often wake up with a stiff back eager for a better option. Enter the solution to my problem. As I began to scour van camping forums (yes, there are other crazy people who want to do this) I found a nugget of pure gold. One of the participants claimed that a full size 6” memory foam mattress would easily fit in the back of a Dodge Grand Caravan minivan. I was thrilled since my husband and I bought a DGC Stow N Go specifically to use as our minivan camper. I couldn’t even contain my excitement as I began perusing every online store I could think of that may carry a memory foam mattress, but is there a downside to this type of minivan camping mattress? What’s the downside to a memory foam camper mattress? Not something you can roll out and set up easily at a campsite (which is actually a benefit to us). What’s the benefit of this type of car camping mattress? A memory foam mattress for the van would allow us the ability to pull over anywhere and sleep without the hassle of setting up “camp”. Plus, the memory foam mattress would allow me to get an amazing night’s sleep and my back would thank me. And.That.Is.All.That.Matters. Problem solved. Or was it? I was convinced that if a 6” mattress would be comfortable, an 8” mattress would be heavenly. So, I began searching for an 8” memory foam mattress for as close to $200 or less as possible. I found what I was looking for at Overstock.com and as a bonus, I even managed to get a gel infused mattress. Isn’t that fancy? Plus, I could place my order using money in my PayPal account and I qualified for free shipping. And then I waited for my precious camping mattress to arrive much like a new mother anticipates the appearance of her child. Okay, maybe that’s a bit dramatic but I want you to know HOW excited I was. 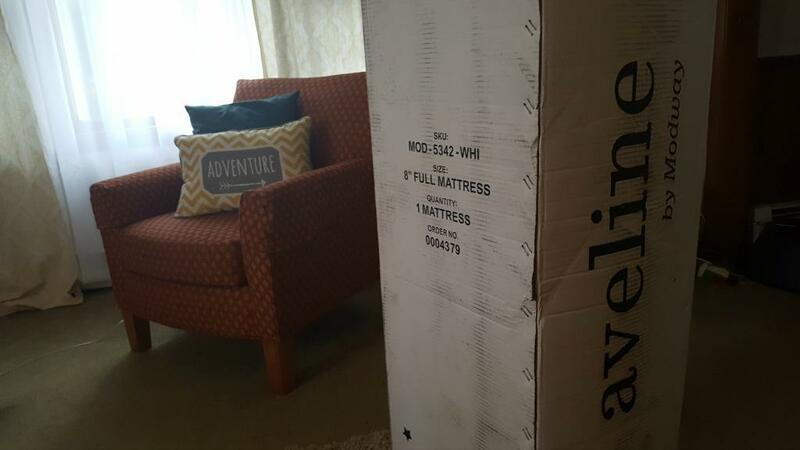 The mattress arrived and surprised me by how heavy it is. I was grateful that this was one time that my delivery man actually delivered the package directly to my front door instead of leaving it at the bottom of the steps. He even asked me if I wanted him to bring it inside for me. I declined, thinking how heavy could it be anyway? Boy, did I find out quickly! That box holding my mattress was like carrying a full-grown body. 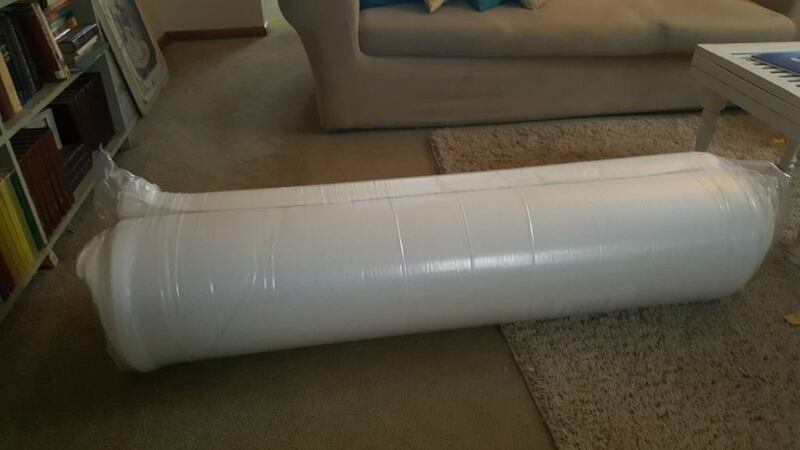 I managed to drag it into my living room where I released the vacuum packed, rolled up mattress from the box it was trapped in and rolled it out on the floor to allow it to expand. 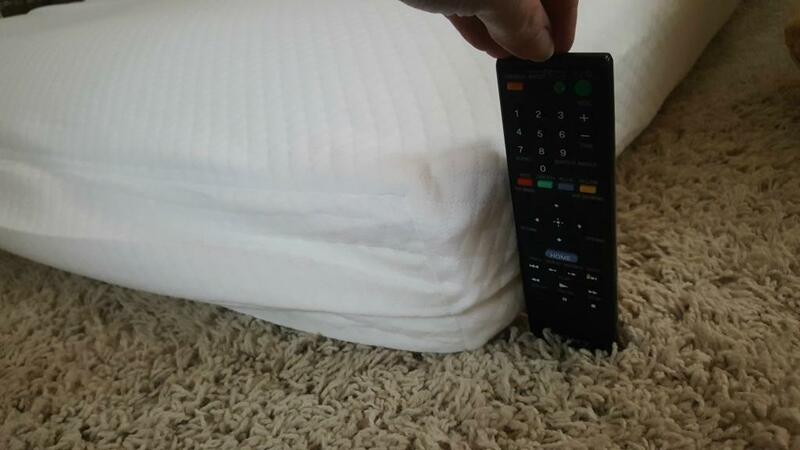 It’s very important that you don’t rush this step so the mattress expands fully. The instructions to my mattress required 48 hours but I left it out for a full week because I’m thorough like that. 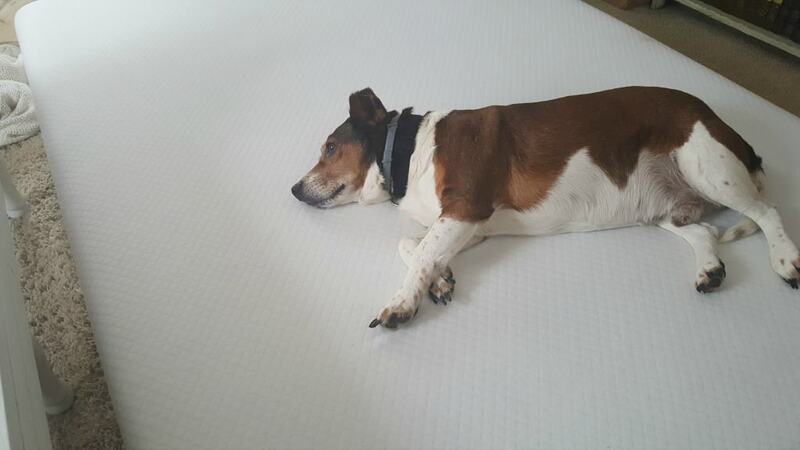 It was over a month later before we tested our mattress but someone dognapped on it every chance he got. My husband packed the mattress out of the house and positioned it in the van before we headed out on a road trip to test it. It did fit a bit snug but that could be because I opted for an 8” gel infused memory foam mattress vs a standard 6” memory foam mattress. I don’t mind if it’s a bit snug. 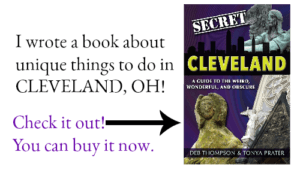 The second I pulled my weary body from the driver’s seat and nestled into the mattress that felt like sleeping on clouds I was thankful for that extra 2”. I slept amazingly! 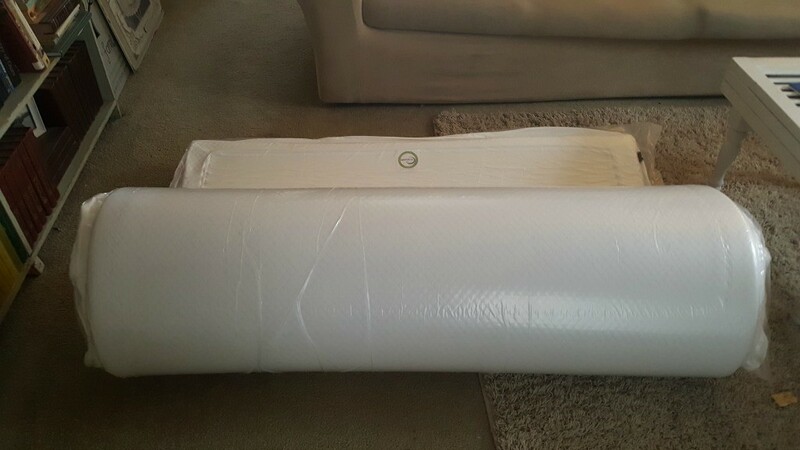 I purchased this mattress from Overstock.com. Just imagine it in a van as the best car camping mattress ever. Amazon.com also sells memory foam mattresses like this one and many are eligible for FREE Prime Shipping. This full size 8″ memory foam mattress offers a medium-firm feel for those that aren’t a fan of the soft and squishy. Whichever mattress you choose, make sure you have a waterproof mattress cover for whatever mattress you choose because the foam will soak up anything that’s spilled on it. The last thing you want is your van camping mattress getting ruined from mildew- which can happen very quickly in hot humid weather. Have you tried van camping? I’d love to hear about your experience. And stay tuned! In the next installation of Van Camping 101, I share these easy to make privacy curtains for your van that install in seconds. 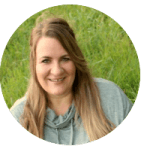 © 2017 – 2018, Tonya Prater. All rights reserved. Did you place mattress on floor of van or place on platform for under bed storage? It is directly on the floor of the van. Our seats fold flush into the floor so we were able to place our mattress flat on the floor which allows plenty of headspace. We found that we have plenty of room for our gear in the very back. How did you manage to squish a 54″ wide matress between th49″ wheel wells? I have been looking for a solution for a couple years. I’ll update the post next time we go van camping so you can see how the mattress fits in our van, Bob. The mattress is memory foam so it squishes right into the back. It is snug, but not so bad that we have issues moving it in and out. It simply forms to the van. We don’t really have large wheel wells that stick out so it’s not really a problem. This Facebook Live video that I made shows our set up and how the mattress fits. In the video, I commented that the mattress was a double, it is a full size which is the same thing. Here is the link to the FB video: https://www.facebook.com/TravelInspiredLiving/videos/1866130886736206/ You can see the mattress at 4:40. Hope this helps. Let me know if you have any other questions. I so want to set up my car for camping. I found searching on the internet that IKEAs foam mattress is good for this too. And heard that you could cut the foam to size (or around the tire wells, if needed). So the one you got from Overstock has got to be awesome! I also just created a spreadsheet of all the outdoor gear I want. And if I can pull my child outside for a bit (how she does not like roadtrips is beyond me. haha), then I have her down for gear too. Costing anywhere from $1,500 – $2,000 (kayak, bike, car accessories to hold it, etc…). Now where would I store it all? An IKEA recently opened near me and I bet you’d find some amazing gear and organizational tools and supplies there. I’ve not been brave enough to look yet. 🙂 We plan to add a top carrier to our minivan but that will be down the road. We haven’t been able to really camp yet because of other commitments and lots of rain & thunderstorms- which is why van camping does have an advantage over tent camping. 🙂 Start small. You can always add as you go and determine exactly what you do need. Thanks for the link to the free campsites. I’ll check it out. I’ve always thought the memory foam would be very comfortable but I worry that it gets too hot? I am “a woman of a certain age”and I can’t tolerate getting hot at night! What did you think? I wanted to allow plenty of time to try this before I responded. We did not sleep on it in the middle of summer, but temperatures ranged from 45 to 60 degrees at night on a recent van camping trip in Minnesota & Wisconsin and the mattress was very comfortable. I wasn’t hot and even got chilled towards the morning. Where do you pull over at night? You can sleep at some rest stops legally- Ohio, California, Washington, Oregon, Idaho allow drivers to sleep for up to 8 hours or longer at a rest stop. 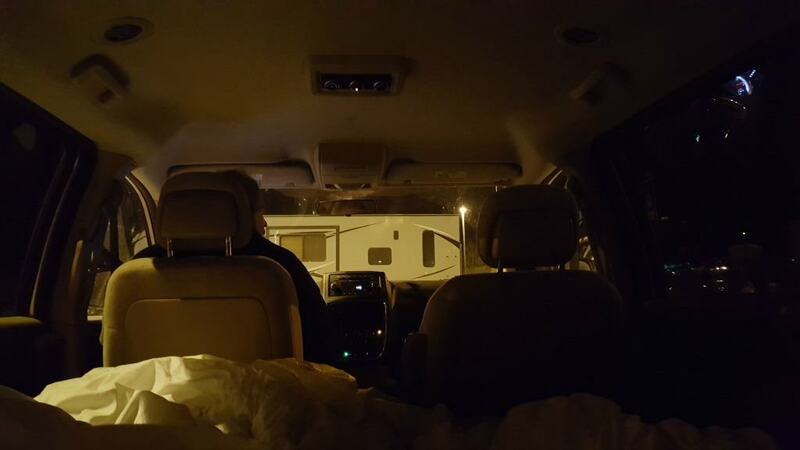 We’ve also stayed at Walmart’s during our RV days. Many allow it just make sure they don’t have signs posted prohibiting overnight stops. Truck stops are the louder option due to the trucks coming and going but we’ve been known to stop at a Flying J when in need of some sleep. If you read the entire series, you’ll see we also travel with our tent- it fits right under our mattress so we’re able to stop at campgrounds too. If we’re in an area for a day or two we always stop at a hotel or campground. I’m not interested in spending that much time in the van. 🙂 It’s more of a point A to point B type of avenue to save a bit of money.